Satan's Empire make a long overdue return with the release of their new studio album, 'Rising', which is due for release on 16th June 2018. The band formed in 1979 and this is their very first commercial release. They initially made an impact on the NWOBHM scene and are remembered mainly for the track 'Soldiers Of War' which featured on a compilation cassette,'Lead Weight', which was released by Neat Records in 1981 and has since gained serious cult status. Today the track 'Satan's Empire' from the forthcoming new album is premiering here on MetalTalk and here it is, for your enjoyment. 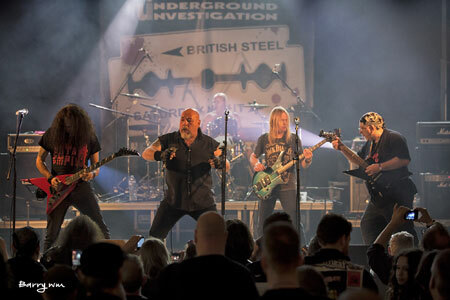 Formed in Dundee but then relocating to London, the band did not last long but after a lengthy hiatus of thirty years they reformed due to huge demand from fans and the reborn band made their debut at NWOBHM Brofest in 2016. Joining the original London line-up of the band - Derek Lyons, Paul Lewis, Wayne Hudson and Sandy McRitchie - is acclaimed drummer Magpie, whose credits include Dennis Stratton, Bernie Torme, Alan Davey and Motörhead, who he was asked to join after recording demo material for the 'March Or Die' album. 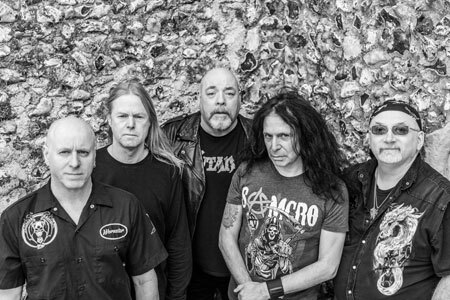 Since that barnstorming initial live show at Brofest 2016, Satan's Empire have stormed their way back to the vanguard of the resurgent NWOBHM and are indeed 'Rising'. They will be showcasing songs from 'Rising' at shows throughout 2018 at home and abroad and are already working on material for the follow-up to 'Rising'. This new material will be road tested before being taken into the studio. 'Rising' is the foundation of the band's future musical empire and yes, he really does have all the best tunes.